Address for FedEx, UPS, etc. 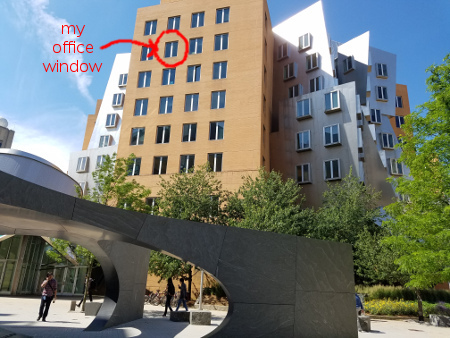 The Stata Center is often described as mazelike and confusing. It is very easy to get very lost if you enter without the proper preparation. Luckily, the proper preparation is very simple. Looks pretty hard to miss, right? Yeah, it shouldn't be hard to find the building, which is at 32 Vassar Street in Cambridge, MA. Step 2: Know that the Stata Center has two towers, Gates and Dreyfoos. The "G" in my office number 32-G842 indicates that I'm in the Gates tower. The building has a few entrances, but the main one (the one closest to foreground in the above photo) is nearest to the intersection of Vassar Street and Main Street. Near this entrance is a large gray sculpture, shown in the photo. This entrance naturally takes you underneath the G tower as you walk into the lobby, and the first elevators you come to go up into G. The two towers are not linked on all floors (mine is a floor without a link), so going up into the wrong one is the number one way to get lost. Step 3: As long as you wind up in the right tower, you won't have any trouble finding my office on the 8th floor. Wandering around aimlessly (say, following the old maze navigation rule of always turning left or right [one or the other, applied consistently]) will get you to my room 842 in no more than a few minutes. (This description sounds scarier than it is; there isn't very much walkable surface area on my floor.) Of course, you could also consult this floor plan with my office marked.